The Hilton Hotel in Sheffield was a new venue for us in 2015. 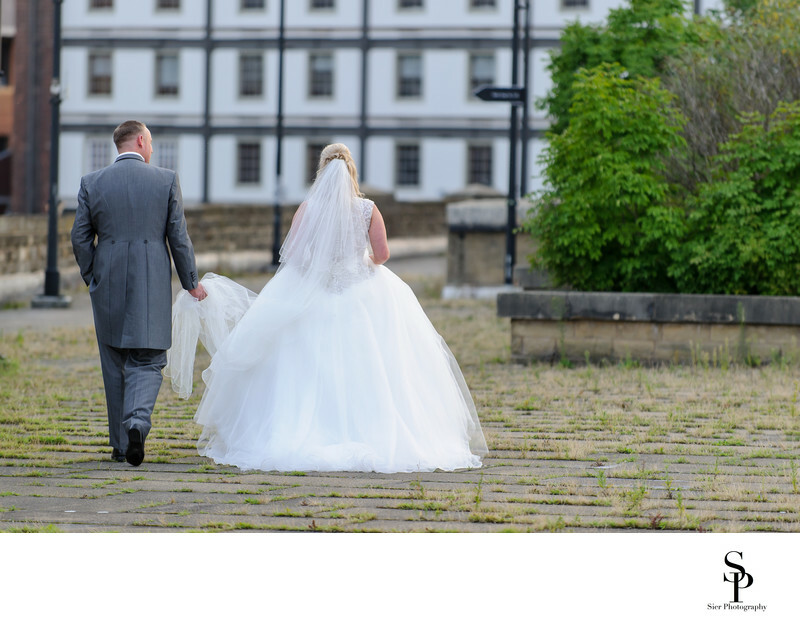 Our Bride and Groom can be seen here walking back towards the hotel and the canal basin in this renovated part of the city. As city centre hotel wedding venues go, this has got to be one of the best. The hotel is stunning, the bridal suite is large and specious with a wonderful balcony overlooking the city centre. The canal makes a wonderful backdrop for guests to mingle and enjoy drinks and some of the paths and walks around the area provide a wonderful backdrop for wedding images of our happy couple. This image was captured late in the day as the sun was starting to set. Nikki and Simon are taking a walk back to the Hilton Hotel following a walk around the area for some pictures. The late evening sun was just starting to change colour and provides a wonderful back-light to this image illuminating the brides veil. I love this image of the beautiful bridal gown juxtaposed against the industrial past of the canal basin. Despite its industrial origins the area is now simply stunning and well worth investigating on a summers evening with a number of bars and restaurants to call in too! 1/160; f/2.8; ISO 250; 190.0 mm.